purified and identified as PGJIF1 and PGJIF2. 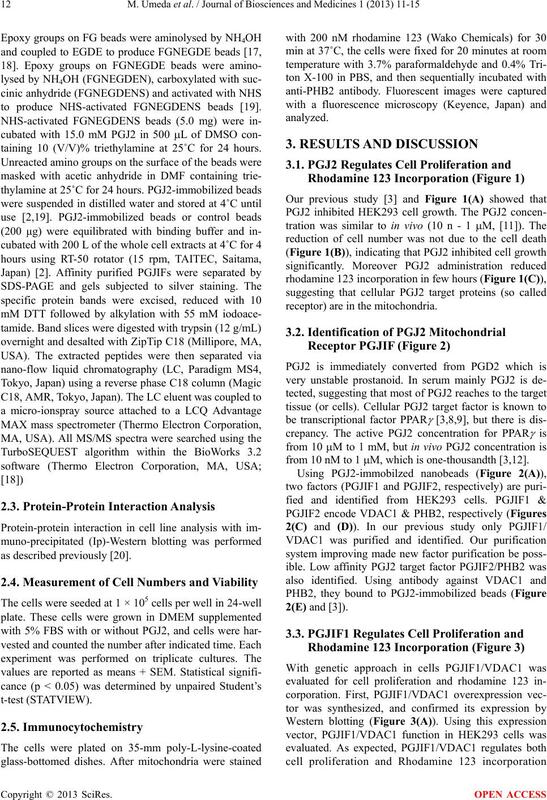 diverse biological activities of PGJ2 in vi v o .
cells using this affinity purification system . function, PGJ2-reduced rhodamine 123 incorporation. 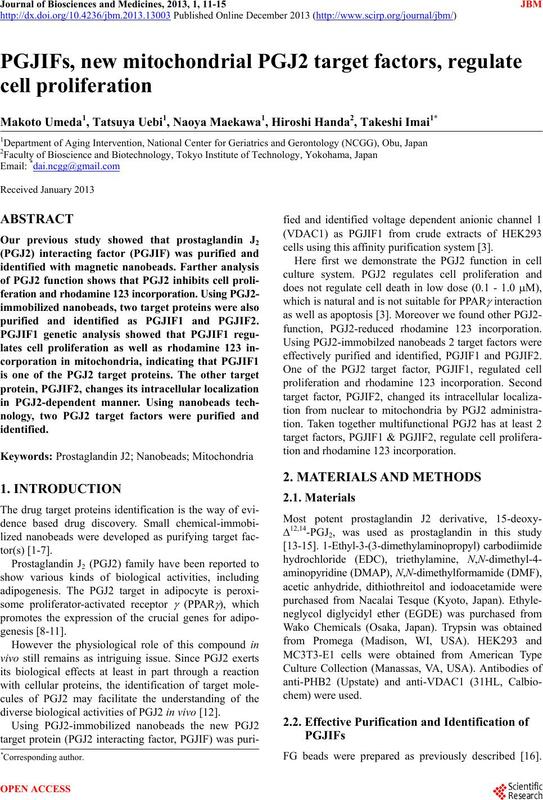 effectively purified and identified, PGJIF1 and PGJIF2. tion and rhodamine 123 incorporation. FG beads were prepared as previously described . to produce NHS-activated FGNEGDENS beads . taining 10 (V/V)% triethylamine at 25˚C for 24 hours. receptor) are in the mitochondria. from 10 nM to 1 µM, which is one-thousa ndth [3,12]. by PGJ2 administration. 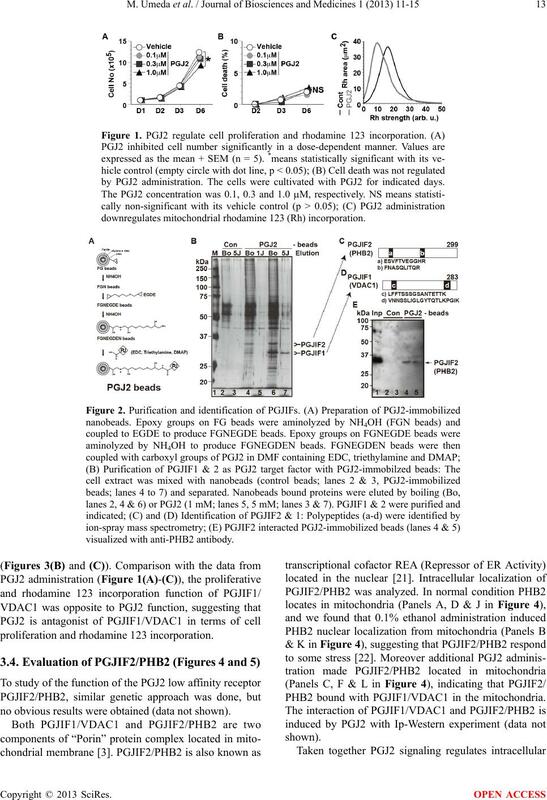 The cells were cultivated with PGJ2 for indicated days. downregulates mitochondrial rhodamine 123 (Rh) incorporation. proliferation and rhodamine 123 incorporation. no obvio us re sults were obtained (data not shown). 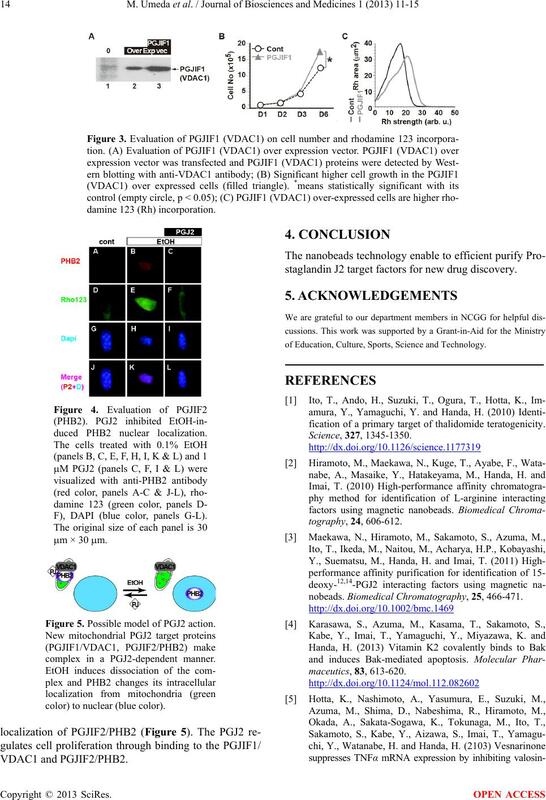 PHB2 bound with PGJIF1/VDAC1 in the mitochondria. F), DAPI (blue color, panels G-L). Figure 5. Possible model of PGJ2 action. complex in a PGJ2-dependent manner. color) to nuclear (blue color). VDAC1 and PGJ I F2/ PHB2. staglandin J2 targe t fa c t ors for new drug discovery. of Education, Culture, Sports, Science and Technology. fication of a primary target of thalidomide teratogenicity. nobeads. Biomedical Chromatography, 25, 466-471.
of Bioscience and Medicine, in Press. ceptor gamma and promotes adipocyte differentiation. Science Publishers Inc., New York, 95-108.
moiety. Angewandte Chemie, 44, 3481-3484.
their analogues. Tetrahedron, 62, 3329-3343. N., Sandhu, A., Kawaguchi, H., Abe, M. and Handa, H.
faces B, Biointerfaces, 64, 162-169.
ka, H., Kawaguchi, H., Watanabe, H. and Handa, H.
drug receptors. Nature Biotechnology, 18, 877-881.
acts with vitamin D receptor among nuclear receptors. signaling. 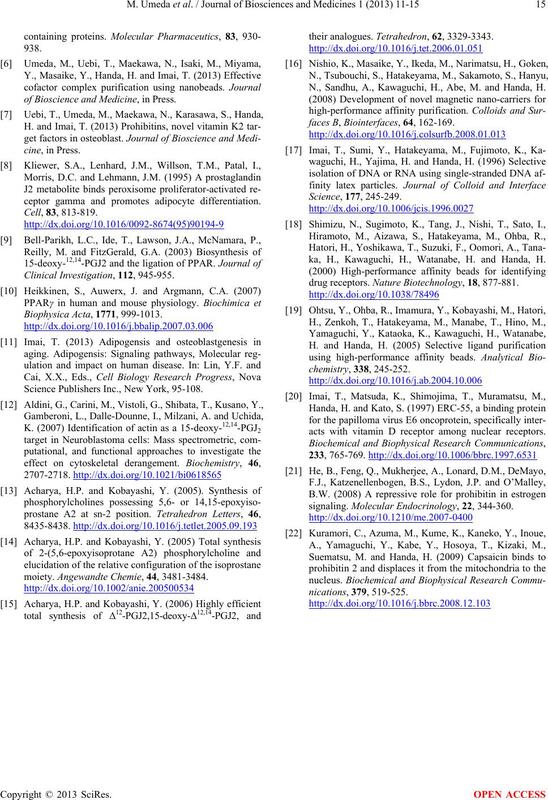 Molecular Endocrinology, 22, 344-360.